Another form of plotting positions in a plane is using polar coordinates. We are used to using rectangular coordinates, or xy-coordinates. 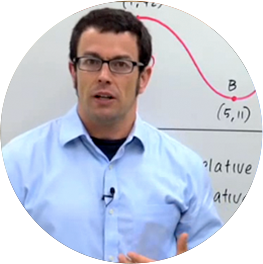 Polar coordinates use a graphing system based on circles, and we specify positions using the radius and angle of a point on a circle centered at the origin. We must also know how to convert from rectangular to polar coordinates and from polar coordinates to rectangular. 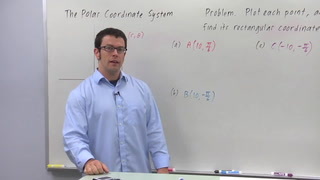 I want to talk about the polar coordinate system. First, just a review of the rectangular coordinate system. Remember that the rectangular coordinate system has 2 axes, an x axis and a y axis and every point in the plane can be described by a pair of coordinates that gives the x and y coordinates of the point. So every point can be described with a sort of an address. And the polar coordinates system does something similar, only instead of using the x and y axis, it uses the polar axis. This is the polar axis. And it calls the origin the pole. Now, a point let's call it p would be described by r and theta where r is its distance from the origin or the pole. This is r and theta is an angle measured from the polar axis. So this is theta. So every point in the plane can be described this way too. Now one of the interesting things about polar coordinates is that the polar coordinates of a particular point aren't necessarily unique. For example this point 3 coma pi over 2, right. It's 3 units away from the pole and it's an angle of pi over 2 from the polar axis, this point can also be located by 3 coma 5 pi over 2, right? It's 3 units away from the pole but you go round pi over 2 and then another 2 pi and get to the same point. You could also describe this point as -3, negative pi over 2 right? You go negative pi over 2 and then go backwards 3 to get here. So what's important to know is that the same point in the polar coordinate system can be described multiple ways. Right? So that's something to be aware of when you're dealing with polar coordinates. Now another thing to be aware of is how to convert from polar coordinates to rectangular and to do that, we need a little Trigonometry. So let's call this this distance x and this distance y. And then the point p can also be described by the coordinates x and y if this is the origin. Well, power x, y, r and theta are related. Well, for one thing they have the Pythagorean Theorem x squared plus y squared equals r squared. For another, tangent of theta equals y over x. And you could also say that x over r equals cosine theta so x equals r cosine theta and y over r equals sine theta. So y equals r sine theta. These equations are going to become really important in the next couple of lessons where we convert back and forth between rectangular and polar coordinates. So once again, the polar coordinate system, the origin's called the pole. We have one axis called the polar axis and we describe points by listing their distance from the pole and their angle from the polar axis.